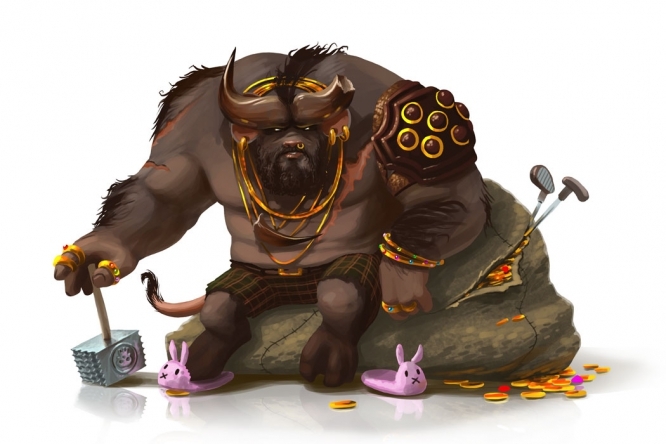 The Retired Minotaur Mouse can be found in Zokor. It is known to drop a very large variety of loot. The Retired Minotaur Mouse prefers Glowing Gruyere, but can be attracted with Standard Cheeses. Forgotten weapons are very effective against the Retired Minotaur Mouse. Arcane weapons are of normal effectiveness. The Retired Minotaur Mouse can only be found in the Lair of the Minotaur. The Retired Minotaur can be encountered at any time in its Lair, but it becomes more common and easier to catch as its state moves closer to Reckless. Hunters may only catch one Retired Minotaur per visit to the Lair of the Minotaur. Hunters are returned to the beginning of the Labyrinth upon catching a Retired Minotaur Mouse. The Retired Minotaur Mouse drops the Minotaur Egg during the annual Spring Egg Hunt. 9 September 2015: The Retired Minotaur Mouse was introduced as part of the Hollow Heights release. This page was last edited on 22 May 2017, at 17:32.